These thriving macaques are highly expressive and intelligent, forming interesting hierarchies within social groups. 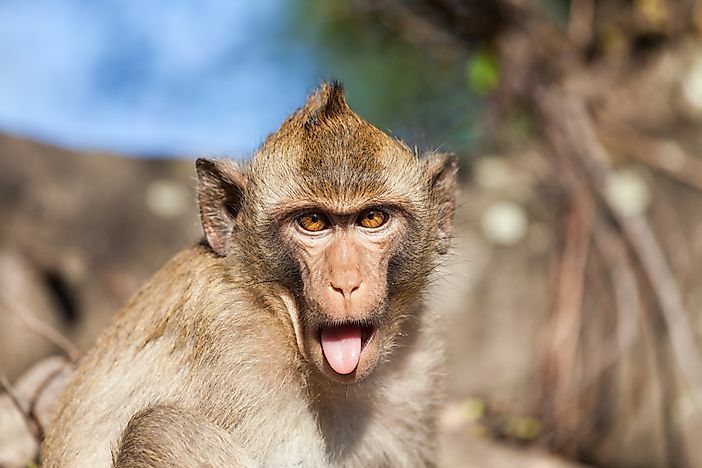 Facial expressions help Rhesus macaques communicate. At times, these gestures have hilarious results. The Rhesus monkey (or Rhesus macaque) is a primate that closely resembles humans. It is very bright and flexible, possessing four limbs and usually moving using all of them. The rhesus has a bare pinkish face, and brown and gray hair. Its tail ranges from 8.1 to 9 inches. Males are slightly bigger than females and, on average, the male weighs 17 pounds with a length of 21 inches, and the female weighs 12 pounds with a length of 19 inches. They are diurnal, meaning that they are most active by day. They are both fast crawlers and skilled climbers. Proficient swimmers, they will often travel in the water for up to half a mile at a time, moving from one area to the next in search of better food and shelter. Rhesus monkeys are mostly herbivorous, feeding primarily on plants, seeds, roots, fruits, herbs, and cereal grains. However, they will sometimes also eat small insects and small invertebrate animals, especially termites, grasshoppers, ants and beetles. But when they live near human environments, they sometimes also feed on crops and food waste. They usually forage during the day on their own, and are known for their food hoarding and stocking behaviors. Native to Asia, Rhesus monkeys can be found in many Asian countries today, including India, Pakistan, Bangladesh, Nepal, Burma, Vietnam, and China. They can adapt to, and thrive in, a wide range of different habitats and climates, though they prefer open and semi-arid environments, such as grasslands and woodlands. They can also be found in mountainous areas with high elevations and cold weather, and can even thrive in human environments such as around temples! Due to their adaptability and flexibility, they are thriving in the world today, and are classified by the IUCN as a species of "Least Concern". Rhesus monkeys, unlike many other primates, are actually comfortable in terrestrial and arboreal environs alike, and do not care to take a plunge into the water. They are social animals, always moving and doing things within a large group. There is a strict hierarchy within each group for both sexes, and their positions within each group is determined accordingly. Female Rhesus monkeys' respective ranks within the hierarchy is usually determined by their respective mothers' rank before them, and younger females are usually the most dominant ones of a given group, probably because they are more fertile than the elder females. They communicate with each other using verbal signals, facial expressions, and body gestures, as well as vocal signals. Rhesus monkeys are very aggressive, especially to outsiders from other groups and those not kin to them. Although there is a breeding season for Rhesus monkeys, they will engage in sexual activities throughout the year. Their breeding season starts in October and lasts until December. Female monkeys prefer dominant and strong males, as these are the ones that can best protect them and their young. Both males and females usually mate with multiple partners during each breeding period, which can last up to 11 days. Gestation lasts roughly 164 days, and females will tend to give birth again within intervals of every 12 to 24 months. Parental care is primarily given by the mother, though the fathers will certainly protect their infants from danger as needed.